If you’ve followed along or caught any of the Primary Singing Time posts, you already know that I’m a newbie with this chorister thing. And now it’s Fall. In Primary. Which means Primary Program time. My first instinct is to panic. But then I ask myself, “Self, have you ever heard anyone say, ‘Wow, that was a really awful Primary program. '” And then I answer myself. “Nope. Never.” The kids are sweet. The teachings of Jesus Christ are taught in simple ways that touch hearts powerfully. And most moms are too teary to even notice if anything goes outlandishly wrong. It’s like the ultimate Sacrament meeting combination. But I still get nervous, and I’m still racking my brain trying to come up with fun ways to review the same songs over and over and over (and over) again. 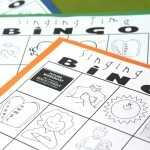 I’ve put together a set of printables of all of this year’s Primary program songs (plus a few extras that we’ve thrown in and some good old Primary classics). These could be used in several ways. You can find the set here and ideas for how to use them below. 1. As signs to let the kids know which song is coming next in the actual program. 2. 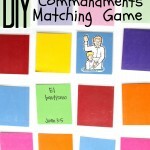 To play a matching game (best with Junior Primary). When a match is found, you sing the song. For this one, obviously, you’d need to make two copies of the set so there are matches. 3. To play the ultimate Fly-Swatter game (best with Senior Primary). 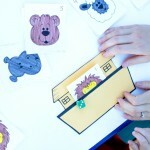 This one is really fun and it seems to be something that the older kids enjoy. I put all of the songs up on the board (just one of each song)-face up so you can see the images and titles. Then, I send two kids out into the hallway. While they’re out, I let the kids in the room know which song we’ll be singing. (Ahead of time, I give the chorister a list of the songs we’ll be singing and the order so she can quickly get to the right pages.) When the kids come in, they come up to the board and receive their fly-swatters. (You’ll need two. Preferably ones that haven’t actually swatted flies, ya know? You can probably find them at your local dollar store.) Then we start singing. No intro, just straight into the song, and the swatters (the kids) try to be the first person to (gently) hit the song with their swatter. You can play with points and teams, or you can just play for fun. I put up all of the pages (including the extra songs and classics) on the board so that there is more searching to be done. I tell the kids ahead of time that if we decide to go crazy with the swatters, the swatters go away. And we just keep singing once the song has been swatted. 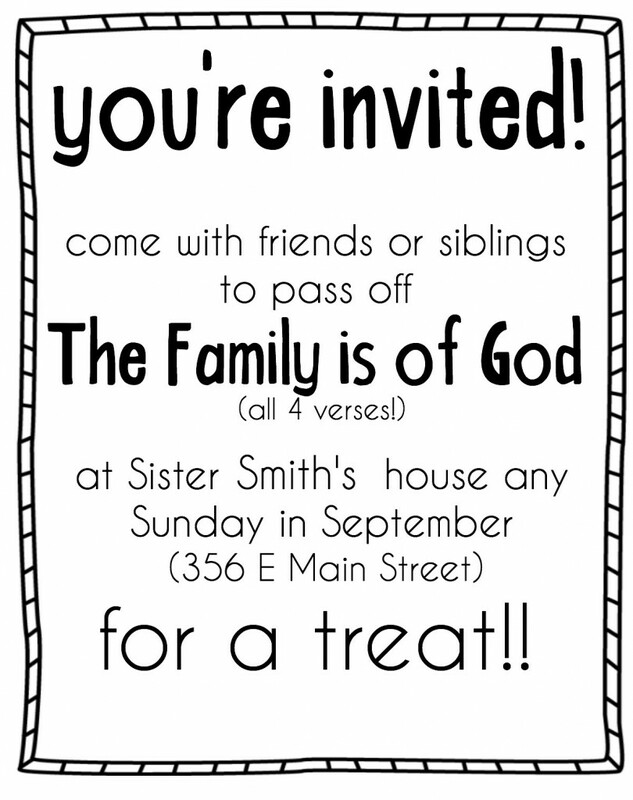 I also did a little invitation this last month for kids to come sing and “pass-off” a particular Primary song at my house for a treat. I passed out invitations at the beginning of the month and let them know that they could come over any Sunday in September to sing for me. I decided to do this because we were behind in learning The Family Is Of God and we were limited in Sundays in September because of Stake Conference and a temple dedication (and then General Conference). 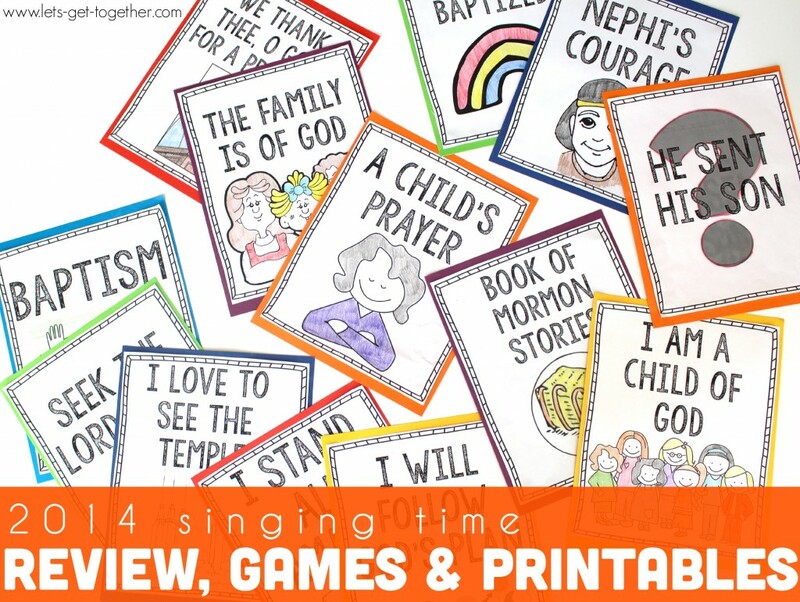 Besides the invitations, I sent out an email to all of the Relief Society sisters that explained what I was doing and where they could find the song online to learn/practice it. I ended up having quite a few kids stop by-and it seems to have increased the singing and confidence of the overall group. But more than anything, it was really fun to get to interact with the kids in smaller groups and have them in my home. It was a bit of an experiment, but I think I would do it again. My next plan is actually something I haven’t tried yet. But it’s in my plans. I’m planning on printing a copy of all of the Primary program songs for each teacher and attaching a little note. The note will say something like this…. 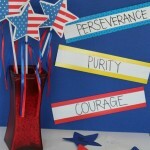 “I desperately need your singing voice to join with us and be a good example for your class. Please jump in and help keep people quiet when they need to be quiet and singing when they need to be singing. You’re awesome and I can’t do this without you! !” But I’ll reword that so it hopefully sounds a little less… desperate. But maybe not. I merged all of the 2014 songs (He Sent His Son, I Will Follow God’s Plan, I Stand All Amazed, The Family Is Of God, Baptism, and Seek the Lord Early) into one PDF that is ready for you (and I) to just print and distribute. You can find that here. Best of luck! Wherever you are, my friend and fellow-Primary-chorister, I’m cheering for you. No worries-it’ll be great!! You’re so welcome! Good luck on the 26th. I’m sure it will be fabulous!! So … CLEARLY, you are doing an amazing job as primary chorister. This post reveals how really great your ideas are. Heck, I want to play the ultimate Fly-Swatter game! 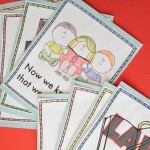 And thank you for the cute, free printables! I always look forward to the primary program because you’re right; there is nothing like primary children’s voices, sharing simple gospel truths, to invite the spirit and touch the hearts of all who listen. It’s going to be sweet! Cindy, you’re so sweet!! Thanks for being so kind. And I totally agree-the Primary program is always a highlight. The kids are awesome! Thank you so much for sharing your talents and ideas. I’m new to this calling and sadly very musically challenged, every little bit of help I can get is so wonderful! Thank Heavens for wonderful people like you and the internet! I was wondering what program you use to make your visual aids? We have 3 songs in our Program that aren’t on here, and I’d love for all of them to look the same. 🙂 -Follow the Prophet, Families Can Be Together Forever and I Believe in Christ. Hi Lyndsey! I just sent some over to Amanda. I can make your 3, but it will probably be tomorrow night or Monday. It’s a challenging job-that’s for sure. But I’m also sure you can do it-and fabulously at that! I’ll email you with your extra signs soon. Take care!! Hi Callie! 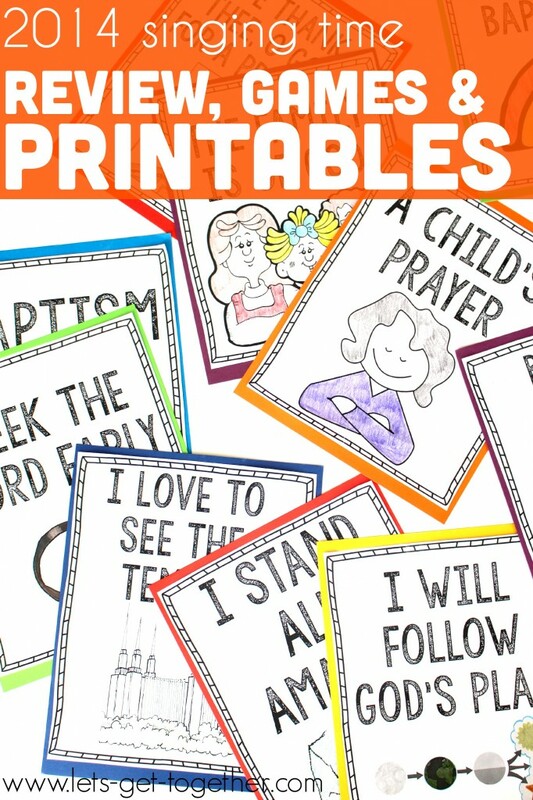 I shared all of my 2015 flip charts in this post: https://lets-get-together.com/2015/01/13/2015-primary-songs-flip-charts/ . 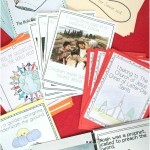 I get lots of ideas from this blog too: http://www.camillesprimaryideas.com/ . Good luck! You’ll be great!! Hello. I downloaded these and they are great. Can I upload to my facebook teachers group for norwegian teachers? They could really use this. I will credit you and link you ofc. Hi Emma! I love to hear when these things are useful to other people! We’d prefer you share the link and send the teachers to the site to download their own copies, but whatever works best will be fine. Have a great day! Thanks for visiting.